Three years have flown by since the Vanguard G era began. The final still from the end of Extra Turn. Thank you for the past 3 Years. A repeat of the contents of the DVD BOXs for NEXT and Z. Reminder to get your tickets for the Vanguard/Buddyfight Convention. 8 contestants from BCF2018 and Buddyfight x Vanguard Festival will be seeded to the Bermuda Triangle Cup. Applications for the Stage Events are over. New Treasure Campaign Sleeves. Taifuku and Mikan style. 53 Sleeves in total. Unite! Team Q4 Twitter Deck Lists will be presented the next time Twitter Deck Lists are presented. Reminder of how “Imaginary Gift Force” work. Start Deck Kai Toshiki features 3 Force cards, one of which has special art of “Dragonic Overlord”. ACT (VC/RC) 1/Turn: By paying the cost (Soul Blast 1), during that turn, this Unit gains Power+10000. 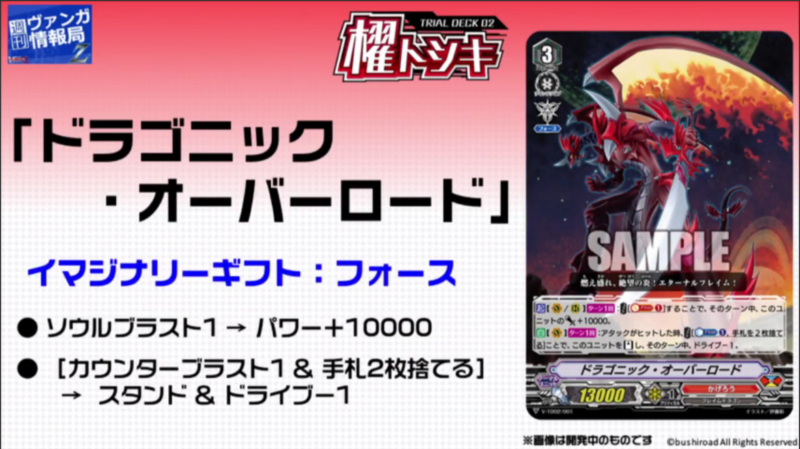 AUTO (VC) 1/Turn: When attack hits, by paying the Cost (Counter Blast 1 & Discard 2 cards from the hand), Stand this Unit, during that turn, it gains Drive-1. Reminder that the new Trial Decks go on sale May 11th, 2018.